My name is Matt and this is my costume. I searched the internet for the scariest skeleton face I could find and ended up combining 3 different pictures to form this. It took almost 3 1/2 hours to complete but was well worth it. 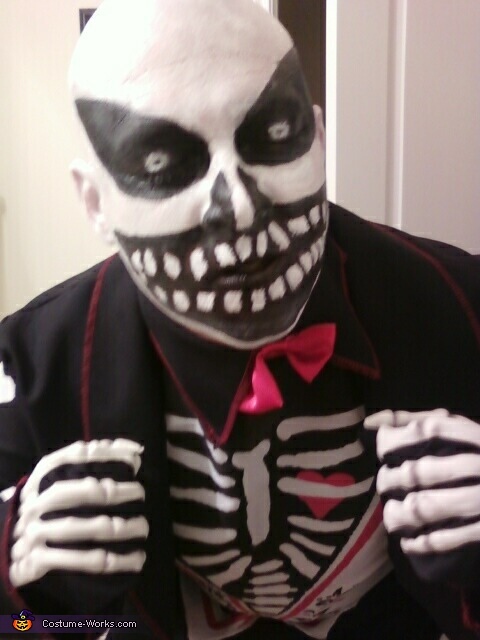 My clothes are a Skeleton groom costume that i've had since last year. My girlfriend had to help me paint the teeth and the eyes... The eyes were painted on my eyelids while my eyes were closed... Definetly had a few weird looks all night. HAPPY HALLOWEEN!!!!!!!!! !